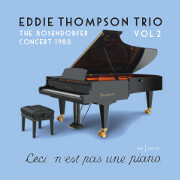 Eddie Thompson CDs @ Hep Records, jazz in depth from the 1930's to the present day. 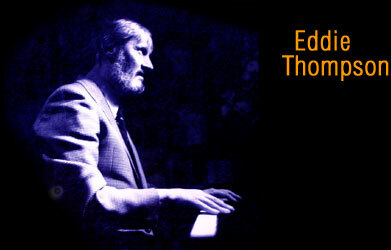 Eddie Thompson was born in Shoreditch, London on May 31, 1925. Blind from birth he first attended Linden Lodge School for the Blind, Wandsworth (as did George Shearing) and then, during the war, at Dorton House, Seal, Sevenoaks. He had been introduced to jazz through listening to the family radio and was awestruck by such greats as Fats Waller, Earl Hines, and especially Art Tatum. His strong personality and love of jazz eventually led to a curtailment of his formal education and by 1947 he was part of the London jazz scene and playing in the company of Vic Ash, Tony Crombie, Ronnie Scott, and Carlo Krahmer. He was able to supplement his jazz income, always precarious, with a career as a piano tuner. One of his first recordings was made in February 1948 with the Johnny Dankworth quartet which had teenage Vic Feldman on drums. 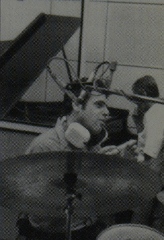 Throughout the fifties he consolidated his reputation playing with top London musicians and was at home playing mainstream or bop. In 1962 he decided to try New York as he felt he needed that challenge that only New York, then as now, can give jazz musicians. He secured a residency at the Hickory House between 1963-67 and made many musical friendships including Duke Ellington, Erroll Garner, and Thelonious Monk. In spite of a growing reputation in New York he returned to London in 1972 where he was soon in demand and formed his own trio. 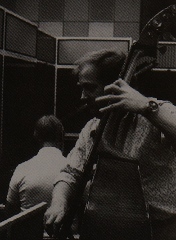 There were regular BBC Jazz Club gigs, he recorded for the German BASF label and Doug Dobell's 77 label, and as visiting American soloists proliferated he became one of the first call accompanists. Eddie's strength other than his prodigious technique was that he knew literally hundreds of tunes with a preference for Gershwin. He also had the ability, when he felt it necessary, to drop into the style of his heroes Garner, Peterson, and Nat Cole. 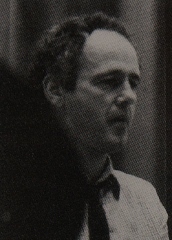 In the late seventies and early eighties he made a series of recordings for HEP as soloist and as equal musical partner along with Roy Williams and tenor saxist Spike Robinson. These are generally regarded as his finest work. Although blind he fearlessly travelled to evening work in London clubs by the Underground, and also to clubs throughout the UK often accompanied by his faithful guide dog, Maida. Sadly, due to a lifelong smoking habit, he developed emphysema which contributed to his early death on November 6, 1986. Paradoxically, in the late eighties his playing enjoyed a sudden popularity in Japan. Such an irony would have caused him to smile. Eddie Thompson on piano with Len Skeat on bass and Martin Drew on drums from 1978. Titles - Surrey With The Fringe On Top / Cool Blues / Ain't She Sweet / You Are My Sunshine / Easy Does It / One Morning In May / Nancy (With The Laughing Face) / There Is No Greater Love / Just Friends / I've Got The World On A String / Wave / Why Don't You Do Right / When Lights Are Low. 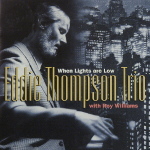 Eddie Thompson Trio - "There Is No Greater Love"
Eddie Thompson on piano, Len Skeat on bass, Jim Hall on drums and guest Roy Williams on trombone recorded at BBC Maida Vale studios, London on 23rd March 1980. Titles - The Lamp Is Low / Keepin' Out Of Mischief Now / Never Say Yes / When Lights Are Low / Don't Stop The Carnival / I've Got The World On A String / Mister Bojangles / Fred / It Never Entered My Mind. Eddie Thompson Trio - "Keepin' Out Of Mischief Now"
Eddie Thompson on piano with Len Skeat on bass and Jim Hall on drums from 1983. Titles - C Jam Blues / Rosetta / Memories Of You / Misty / Paris Mambo / Round Midnight / Love Will Find A Way / Satin Doll / alternates Memories Of You / Round Midnight / Love Will Find A Way. Eddie Thompson Trio - "C Jam Blues"
Live performances from Spike Robinson with Eddie Thompson, Len Skeat and Jim Hall recorded at Chesters Club, Southend-on-sea on 26th July 1984. Titles - S'Wonderful / Flamingo / Emily / I'm Gettin' Sentimental Over You / I Should Care / Ow / Everything Happens To Me / Please Don't Talk About Me When I'm Gone. Spike Robinson with the Eddie Thompson Trio - "S' Wonderful"
The second volume of live performances from Spike Robinson with Eddie Thompson, Len Skeat and Jim Hall recorded at Chesters Club, Southend-on-sea on 26th July 1984. Titles - You'd Be So Nice To Come Home To / Emily - Take 2 / East Of The Sun / But Beautiful / The Way You Look Tonight / Skylark / I'm Beginning To See The Light / That's All. 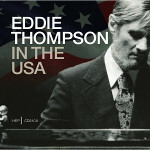 Spike Robinson with the Eddie Thompson Trio - "East Of The Sun"
Brilliant concert from UKs most swinging pianist. Titles - The Breeze and I / Pennies from Heaven / Drop Me Off in Harlem / I Want to Be Happy / Shadow of Your Smile / Autumn Leaves / C Jam Blues / I Got Lost in His Arms. 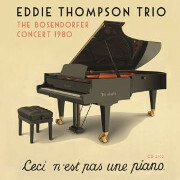 Eddie Thompson Trio - "I want to be happy"
It would appear that there has been an error in the information supplied for the Eddie Thompson CD2102 "The Bosendorfer Concert 1980" so please note the following correction. Due to a slight confusion the reference to MASH in booklet and back titles is a mistake and should be "Corcovado" by Antonio Jobim.